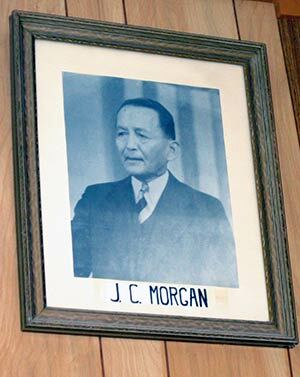 TOP: A portrait of J.C. Morgan, fifth Navajo Tribal Chairman and a Nahodishgish native, adorns the Nahodishgish Chapter House. 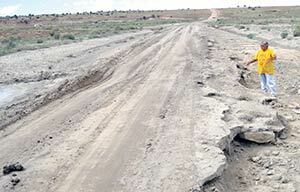 BOTTOM: Nahodishgish Chapter President Vanessa Begay Lee shows a road that nearly washed out during the recent monsoon. Lee said the chapter has purchased culverts for the road and McKinley County has agreed to install them, but since it is a BIA road, neither the county nor the chapter is allowed to repair it. The road is on a school bus route, according to Lee. As a police officer for 20 years, Vanessa Begay Lee got used to people doing what she said. As president of a Navajo Nation chapter for the past nine months, she's had to get used to people saying, "There's no way we can do that." "Red tapes, everywhere!" griped Lee when the Navajo Times visited Nahodishgish Friday. In an effort to repair a washout-prone section of road, the chapter has purchased its own culverts and had enlisted the help of McKinley county to lay them ... but, according to Lee, the BIA balked at letting the county lay a hand on its road. The culverts sit idle near the chapter house, and the road washed out again during the monsoon. Lee wanted to farm participants in the chapter's summer youth employment program out to local elders to help them chop wood and repair their homes, but found out child labor laws prohibit transporting underage workers. She couldn't even enter a youth quilt project in the Navajo Nation Fair ... the art has to be done by an individual. Red tape everywhere. But there is one thing the chapter has control over, and that's its social activities. You won't find a more well-used chapter house than in this tiny chapter of 1,000 or so souls just over the ridge from Gallup. The year generally starts out with a traditional shoe game. Then it's the Valentine's Day candlelight dinner for local couples. Spring brings the Easter egg hunt. As school winds down, the chapter hosts a black-tie banquet for all student athletes and their parents -- and you'd better believe students and even parents will be turned away if the organizers don't think they're dressed appropriately, or if the kid's grades are flagging, or if "I find out you got kicked off the team for some reason," warned Lee. The most highly anticipated holiday here is Labor Day. People from Nahodishgish, even if they fled from the city years ago, come back to enjoy traditional games like the goat-and-fruit scramble (if you have to ask what that is, you're under 30 and not from around here) and tug of war. "It's really fun," said Lee, showing off two big poster boards of Labor Day photos displayed on the chapter house wall and bragging that she's usually on the winning side of the tug of war (which, once you've met her, is no surprise at all). Then it's the Halloween carnival, the Veterans Day parade, Thanksgiving dinner, the Christmas dinner, and "We start all over again," Lee said. In between, there's a beautiful old stone hogan for ceremonies, and a butchering shed and charcoal pit for when veterans come home and it's time to kill the fatted sheep. "This place," summed up Accounts Maintenance Specialist Lucinda Begay, who hails from nearby White Rock Chapter, "is a real community." It's really more of an extended family. Name: More correctly spelled "Nahodishgiizh," it means "The Gap," referring to the pass over the ridge on the chapter's southern boundary that used to be a major road to Gallup. Originally called "Dalton's Pass" after Jesse Dalton, the bilagaana who started a trading post here in 1927, the chapter reverted to its Navajo name a few years ago: the first chapter to do so, according to its president, Vanessa Begay Lee. Land area: One of the Navajo Nation's smaller chapters. You can take a complete tour of Nahodishgish in 20 minutes or so. History: This area was settled by Navajo families returning from the Long Walk in the late 1860s or early 1870s. The main pioneer family adopted the name Morgan, a name you still hear a lot in the chapter today. Problems: This chapter has not a single paved road. There are also some homes without running water or electricity, but because of their location on a ridge above the water table, it would be extremely expensive to pump the water to them. Unemployment is high and it's a difficult place to start a business because of competition with the relatively large community of Crownpoint only 12 miles away. "Everyone here is related to everyone else," said Lee, adding with a laugh, "whether they like it or not." For being so close to Gallup, Nahodishgish is surprisingly traditional. Many people here, even the young ones, still speak Navajo, and Lee is thinking about making the chapter house a "Navajo-only zone" to keep the momentum going. There are many good weavers here, remnants of the days of the old Dalton Pass store, where the Dalton family would take a rug in trade for groceries if you didn't have cash. The store, and even the road over the pass are gone now. All that remains of the old trading post is a square of crumbled stone you'd walk right by unless someone pointed it out. "I don't even know what happened to the store," said Lee. "It seemed like one day it was there, and the next it was gone." Further attempts to start businesses in Nahodishgish haven't gone anywhere, probably because the chapter is only a few miles from Crownpoint, which has all the necessary services. But Lee thinks a laundromat would fly, and she'd like to see the abandoned Head Start building turned into a private or non-profit day care for the many parents who commute to Crownpoint, Gallup or Window Rock for work. Head Start closed, she said, "because they told us we didn't have any children here. Can you imagine? Did they just drive by and only count the old people like me?" This is a chapter of independent people, Lee says, and she's trying to keep it that way. She doesn't like handouts, and when asked about unemployment in Nahodishgish, she retorts that there are plenty of skilled jobs within commuting distance "if you're not too lazy to get an education." Like most chapters, Nahodishgish gives out scholarships, but here you have to give back. "Anyone getting a scholarship has to put in four to five hours of in-kind service at the chapter," Lee explained. If you attend the sports banquet or one of the other chapter events, you'll likely see college kids waiting tables. And you know what? "They like it," Lee said. "Volunteers really make this chapter run," noted Begay. Even the spotless chapter house is mostly due to some locals who take pride in keeping the chapter's public spaces inviting. If you're bored in Nahodishgish, don't worry, Lee will find something for you to do, and make sure that you do it, too. Perhaps every chapter should have a stern másáni for a president. Especially one who used to be a cop.